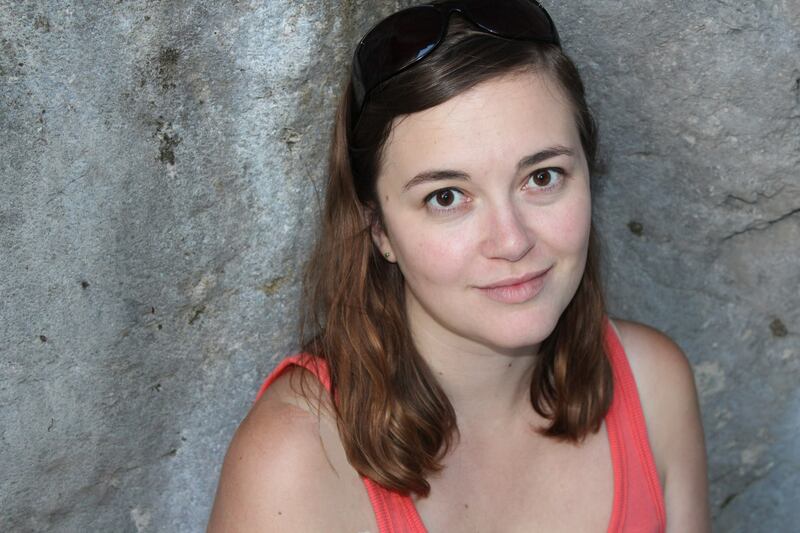 Emily Ursuliak lives in Calgary and writes both fiction and poetry. She is the host of the CJSW radio show, Writer’s Block, which you can listen to in podcast form here: https://soundcloud.com/cjsw-90-9-fm/sets/writers-block. She has an MA in English from the University of Calgary where she worked on her first novel and collection of poetry. You can find out more about her at www.emilyursuliak.com. Geosi Gyasi: You’re the host and producer of CJSW’s literary radio show “Writer’s Block”. Could you tell us what this program is all about? Emily Ursuliak: Writer’s Block celebrates all things literary. The show is mostly interviews with authors, although I also talk to people at independent book stores and play spoken word tracks. The authors we have on the show are primarily Canadian, although we have had a few international authors. I also try to have a balance of fiction, nonfiction and poetry interviews on the show as much as possible. Geosi Gyasi: How did you get started with the CJSW’s literary radio show “Writer’s Block”? Emily Ursuliak: I started with Writer’s Block just under two years ago. My friend Paul, who was one of the hosts at the time, was looking for people to help out with interviews. I did an interview with a poet named Vivian Hansen, and Paul taught me how to do the production end of things after and I got hooked. As I was helping them out as an executive producer for the show both Paul and Steph (the other host of the show who was actually responsible for starting it) told me they’d both like to step down as hosts and asked if I would be interested in taking over, so of course I said yes. I’ve always loved listening to spoken word programming, but I never imagined I’d get an opportunity to produce it myself. Geosi Gyasi: You once held a role with “filling Station” magazine. What work did you do there? Emily Ursuliak: I was a member of the fiction collective when I first began volunteering with filling Station; the fiction collective is the team that assists the fiction editor. Then, while I was still in the fiction collective, I was the coordinator for a community writing event called Hot Dates with Blank Pages where we met once a month in different locations in Calgary to do writing inspired by our city. Last December I moved from being a fiction collective member, to leading the fiction collective as the fiction editor. I held that position for just over a year, and then had to step down this February when it was becoming too difficult to balance doing both Writer’s Block and filling Station. Geosi Gyasi: What’s the difference between working for magazine and that of radio? Emily Ursuliak: Both involve promoting the work of writers, but promoting in different ways and to some extent promoting at different stages of a writer’s career. When I was the fiction editor for filling Station I was choosing which fiction submissions would get accepted for publication for the magazine. Some of the pieces I picked for publications were the first pieces of writing these authors were getting published, so it feels great to be a part of that moment in a writer’s career. For Writer’s Block I’m interviewing writers who are a bit further along in their careers and maybe they’ve just had their first book published, or they might even be award-winning best-sellers who have quite a few books out. filling Station involved helping produce a printed object, while Writer’s Block involves creating and editing sound that I broadcast on radio, and also put up as podcasts. As someone who works a lot with the written word in a lot of different ways, making radio is refreshing because even though I’m still talking about books, I get to do sound editing and production, which I absolutely love. It’s a very meditative process, editing a radio show. Geosi Gyasi: Why do you think you were awarded the 2013 Volunteer of the Year Award by the Alberta Magazine Publishers Association? Emily Ursuliak: The main reason was that I worked with an awesome team of people who decided to nominate me and write really amazing letters of support. I didn’t know they were going to nominate me and it meant a lot. I guess the reason they chose to do that was that I took on a lot of stuff outside of the positions I mentioned earlier. I created and ran a fundraising event for two years and I helped out wherever it was needed. I just did what I thought you ought to do when you sign up to volunteer, help out in any way you can. Geosi Gyasi: You taught creative writing courses through organizations such as the Alexandra Writers’ Centre Society. What experience did you gain teaching creative writing courses? Emily Ursuliak: Teaching creative writing makes me remember what I was taught by my writing mentors, because some of the exercises I use are ones I really loved doing as a student. But what I’ve really enjoyed is creating new writing exercises and being forced to put my own approach to writing into words. I love teaching students who ask lots of questions and challenge the writing exercises I’ve asked them to do. Sometimes I have to pause to think about how I’ll explain something, and it really pushes my teaching to the next level, and also my understanding of the writing process. Geosi Gyasi: You hold an MA in English from the University of Calgary. Why did you decide to study at the University of Calgary? Emily Ursuliak: When I was an undergraduate student my mentor was my first creative writing professor, Rod Schumacher. He was the one who told me I should study creative writing at the graduate level. He gave me really good advice when I was deciding on which programs to apply for. He told me to read the books of the professors in the programs and find someone whose writing I admired, whose skills I felt I was lacking. I read the books of several different professors and then devoured Suzette Mayr’s novel Moon Honey and knew she was who I wanted to work with. Suzette has a way of making you feel like you’re really in the body of the character. The physicality of her characters is so rich. I knew that’s what I was missing. All my previous characters had been floating heads; I didn’t really write about what it was like to be in their bodies. The choice was pretty clear to me. Another important factor is that Calgary is only a couple of hours from where I grew up. I’m pretty close to my family and it would have been hard to be too far away from them. Geosi Gyasi: Poetry and Fiction – which of them is difficult to write? Emily Ursuliak: They both are, and they’re both also very enjoyable, both for different reasons. In poetry the challenge is how detailed the work is. Sometimes I can spend an hour agonizing over one line. In fiction, especially in the novel form, the biggest challenge is creating a strong narrative frame, and making sure you stay consistent with the voice of your character. I feel less anxious about fiction though. I can run free in fiction and I don’t feel like I’m quite so hard on myself. It’s hard for me to let go of the idea of narrative, and I used to feel like my poetry was weaker because there was always a story in my poems and I couldn’t write a poem without doing that. I’m starting to accept that that’s just who I am as a writer, but I feel a lot more anxious about the quality of the poems I put out into the world. Geosi Gyasi: What’s the inspiration behind your short piece, “Planting” as published in Issue 3 of One Throne Magazine? Emily Ursuliak: “Planting” is a prose poem from my manuscript The Diamond Hitch, which is a collection of poems inspired by the travel diary my grandmother and her friend Anne kept on a trip they took together in 1951. They were living in Victoria, British Columbia and decided to drive the 1927 MG Roadster they owned together to Red Deer, Alberta, where they bought two horses and a pack horse, which they rode back to Victoria on. “Planting” is about Walter, one of the characters they met along the way. Anne and my grandmother wrote about the stories Walter told them and his odd home, and I loved how eccentric he was. One Throne wanted to publish it as a piece of flash fiction, and I was ok with that because prose poems can straddle the boundary between fiction and poetry. Geosi Gyasi: What sort of preparation do you do before writing a poem? Emily Ursuliak: It really depends on the poem. For the poems from The Diamond Hitch I would revisit the part of the travel diary I wanted to make into a poem and take down notes about what I wanted the poem to capture. I often do a lot of brainstorming and free writing beforehand and my rough drafts are almost always written out by hand rather than on a computer. Geosi Gyasi: Where did you get the idea to write, “Bowness”? Emily Ursuliak: “Bowness” is a poem I wrote in response to volunteering during the cleanup after the 2013 flood that happened in Calgary, and also had a devastating effect on other areas of southern Alberta. The Bow River that runs through the city flooded large parts of it. The downtown core of the city was shut down for about three months in order to repair the damage and a number of neighbourhoods were also heavily affected. The beautiful thing about the flood was that it brought out the best in Calgarians. As soon it was safe a large number of the residents from unaffected areas came out to volunteer with the cleanup. The first volunteer experience I had was helping gut the destroyed basement of the in-laws of a friend-of-a-friend. My friend and I were given the task of ripping up the carpets. We climbed down into this dark basement that still had a foot of water in it and my friend and I took turns holding a flash light while one of us cut the sodden carpet into strips that would be manageable enough to haul out. It was tough work, and it was a very odd experience. I wrote the poem because I wanted to write about what that felt like, to hack into a destroyed piece of someone’s home. Geosi Gyasi: Who are your favourite writers? Emily Ursuliak: For fiction: Heather O’Neill, Miriam Toews, Gabrielle Garcia Marquez, Nalo Hopkinson, Sarah Selecky, and Sara Tilley. For poetry: Michael Ondaatje, Nicole Brossard, and Robert Kroetsch. Geosi Gyasi: As an interviewer yourself, what are some of the challenges you face interviewing writers? Emily Ursuliak: I want to ask questions that honour the work a writer has put into their book. I want to dig a bit deeper into the work and ask questions that maybe they haven’t been asked before. When I really love and understand a book this isn’t too hard, but sometimes I get books that I don’t have the same connection too and it can be difficult to come up with the quality of questions I want to be asking. Doing a radio interview is also weird because it’s kind of like I’m having a conversation with the writer, but it’s also a partially scripted performance and later on I know I’ll have to go back and listen to the entire thing and edit it. Geosi Gyasi: Do you know why you write? Emily Ursuliak: Because I have to. I don’t write as regularly as I’d like to, and when I go too long without doing it it affects me emotionally. I feel depressed, or cranky, or a bit off-balance. And then when I do start writing again I feel restored. Emily Ursuliak: Yes, definitely. I would say the best word to describe how I feel as a writer right now is grateful. I’ve had a lot of really amazing mentors who have gone out of their way to help me grow as a writer. There are definitely times when I get scared and anxious and I don’t know if I’ll be able to “make it” as a writer, and then I think of my mentors. Thinking of them drives me to put my anxieties behind me and get back to work because I don’t want the time they spent on me to be wasted. I’m also grateful because I’ve found a great community of writers in Calgary. They’re like my second family. They’re supportive friends and their writing inspires me. Geosi Gyasi: Are you working on any new writing project? Emily Ursuliak: Yes and no. I’m working on editing the novel I wrote for my masters thesis. I’ve been working on it for a few years though and so I need to take breaks from it sometimes. That’s when I work on new projects. I wrote a new short story this winter to submit to an anthology that one of my friends is putting together. I also have this idea for a new collection of poems about the work of Alexander McQueen. I have a few poems for it already, but there’s a lot left to write. This entry was posted on Wednesday, June 17th, 2015 at 4:02 am and is filed under Uncategorized. You can follow any responses to this entry through the RSS 2.0 feed. You can leave a response, or trackback from your own site.